It’s a rare treat for me to get my son Ben all to myself. Since he discovered sport, I’ve been forced to share him with a rugby team, a rowing crew, a swimming squad and throngs of supporters at various sporting events. So when he was granted a day off from school as a reward for good work I seized the opportunity to smother him with motherly affection. Of course he was having none of it but did ask if he could spend the day seeing what “I actually did for living”. In the diary for this particular Thursday was a meeting with one of the group editors which was deemed ‘boring’, a sneak preview of the new cygnets in Chiswick House which slightly raised one eyebrow in interest and reviewing the newly opened Persian restaurant Chella which hit the jackpot. 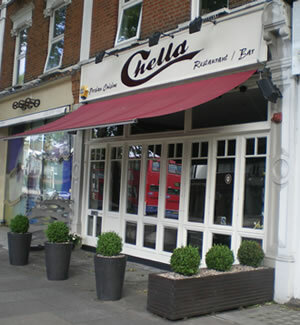 Unlike some restaurant refurbishments, there’s no mistaking what was there before Chella opened its doors a week ago. It still looks just like Gravy but with Arabian background music and a new name painted above the door. Even the furnishings are exactly the same, it’s the food that is completely different. The first Chella Restaurant was first opened in Tehran 50 years ago by the father of Chef and co-owner of the new restaurant Keyvan Barzegar. He and his business partner Ara Chobanian chose ‘cosmopolitan’ Chiswick for their new venture where they aim to mix 'traditional Persian food with a modern cosmopolitan atmosphere'. Having lived in the Middle East for a few years, Ben and I found no great surprises on the menu which comprises starters, side dishes, grilled meats, stews and desserts. We chose lamb meatballs in tomato sauce (£3.25) and Persian style prawns in a herb and tamarind sauce (£3.95) from the starters menu and requested a basket of Taftoon bread (£1.25) to accompany them. Both came served in small bowls and tasted precisely of their descriptions. Both were good but not special. For our mains I went for Ghafghazi (£9.50) – a marinated and grilled kebab of lamb and chicken fillets served with rice and salad. Feeling adventurous, Ben opted for Momtaz (£9.50) – two kebabs, one of minced lamb and the other of grilled chicken again with rice and salad. Whilst we ate, we pondered on why lamb is called lamb, chicken is called chicken but beef isn’t called cow. “And pork isn’t called pig is it?” was my contribution to the conversation, a comment met with that look only achievable by those in their teens and directed at their not quite with it parents. Not fair really, I thought I had a valid point but decided to let the subject rest. As Ben's conversation moved deeper into the intricate plot of X-Men Wolverine, I tried distracting him by asking what he thought of the food. “Well the lamb tastes sort of lamby but the chicken is really nice and chickeny,” came the response before he returned to the film’s storyline. Sampling it, I discovered he was indeed correct on both counts although he didn’t do the chicken kebab justice by calling it chickeny, it was delicious. As was mine but the star of the show for me was the grilled fillet of lamb, a meat that in my opinion is often treated very well in Middle Eastern cuisine. We shared a dish of Boorani Ye Esfenaj (£2.95) a delicious mixture of spinach and thick yoghurt which complimented the grilled meats very well indeed. From a comprehensive wine list I chose a glass of Pinot Grigio (£5.20 - it was a large one with lots of ice!) and Ben had a pineapple juice (£1.75). We couldn’t manage dessert but I did squeeze in a decent Americano (£1.95). The bill without service came to £39.30. Although there is very little difference in the décor, there are enough subtle distinctions which should allow Chella to become more than simply the ‘restaurant on the old Gravy site’. There are still a number of small refinements to be made, but given that they’ve been open for a mere seven days, I doubt these will take the two partners much longer to achieve. Emma Brophy - with special thanks to Ben Brophy for his invaluable contribution and fantastic company.